Dr Koji Kono has been striving to develop immunotherapies for cancer patients, in addition to his practice as an upper GI surgeon. His approach is based on a translational research from the viewpoint of both surgical oncology and tumor immunology. His main research themes are to develop cancer vaccine with immunogenic peptides and to establish a novel NK cell therapy against gastric and esophageal cancer. During the next 5 years, we wish to pursue 2 major directions for our translational research. First is antigen-specific immunotherapy based on cancer vaccines with multiple peptides. Previously, we identified immunogenic epitopes of peptides preferentially expressed in gastric and esophageal cancer cells and developed clinical trials which yielded encouraging results, leading to the design of a phase III trial currently ongoing. These vaccines were prepared to match a common HLA type among Japanese, HLA-A2402. However, Chinese Singaporean most frequently express the HLA-A1101 type. Thus, our aim is to use the protocols that we have successfully established and to generate vaccines matching the HLA-A1101 type. Once we identify the immunogenic peptides, we can apply for the cancer vaccine, in particular as a combination with chemoradiation, since we recently reported that chemoradiation can induce the immunogenic tumor cell death with tumor-specific immune responses. 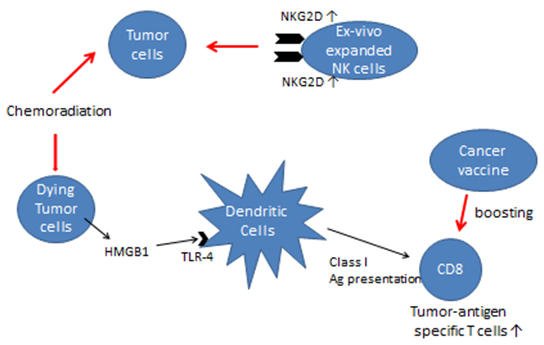 The second major direction of my research centers on the adoptive transfer of ex vivo expanded NK cells. In preliminary studies, we demonstrated that NK cells expanded with the unique method (“super NK cells”) are much more cytotoxic against gastric cancer cells than resting or IL-2 activated NK cells. We also found that these NK cells mediated superior antibody-dependent cell cytotoxicity in the presence of Herceptin and that NK cells from gastric cancer patients could be expanded as well as those of healthy donors. Based on the promising results, we will initiate a phase I clinical trial of adoptive transfer of autologous super NK cells for gastric cancer, to evaluate safety, feasibility as well as immunological response. Yoshiyuki Suzuki, Kousaku Mimura, Yuya Yoshimoto, Mitsuaki Watanabe,Yu Ohkubo, Shinichirou Izawa, Kazutoshi Murata, Hideki Fujii, Takashi Nakano, and Koji Kono. Immunogenic tumor cell death induced by chemoradiotherapy in patients with esophageal squamous cell carcinoma. Cancer Research 2012 Aug 15;72(16):3967-76. Koji Kono, Eiji Sato, Hirofumi Naganuma, Akihiro Takahashi, Kousaku Mimura, Hideaki Nukui and Hideki Fujii. Trastuzumab (Herceptin) enhances class I-restricted antigen presentation recognized by HER-2/neu-specific CTLs. Clinical Cancer Research 2004;10:2538-2544. Koji Kono, Akihiro Takahashi, Hidemitsu Sugai, Hideki Fujii, A. Raja Choudhury, Rolf Kiessling, and Yoshiro Matsumoto. Dendritic cells pulsed with HER-2/neu-derived peptides can induce specific T-cell responses in patients with gastric cancer. Clinical Cancer Research 2002;8:3394-3400. Koji Kono, Akihiro Takahashi, Fumiko Ichihara, Hideki Amemiya, Hidehiko Iizuka, Hideki Fujii, Takayoshi Sekikawa, and Yoshiro Matsumoto. Prognostic significance of adoptive immunotherapy with tumor-associated lymphocytes in patients with advanced gastric cancer: A randomized trial. Clinical Cancer Research 2002;8:1767-1771. Koji Kono, Akihiro Takahashi, Fumiko Ichihara, Hidemitsu Sugai, Hideki Fujii, and Yoshiro Matsumoto. Impaired antibody-dependent cellular cytotoxicity mediated by Herceptin in patients with gastric cancer. Cancer Research 2002;62:5813-5817.